I always teach that translation is, by definition, commentary. Not that we always have a choice. Especially when it comes to Torah learning, there are times when we must rely on translations since we are simply unable to always read or understand ancient Aramaic or Hebrew. Yet, any time we do not see the original language for ourselves—any time we must rely on someone else to tell us what it means—we need to be cautious. Not to say that it isn’t an excellent translation or as true as possible to its source, but it is a translation nonetheless, which leaves room for misinterpretation at best, and mistakes at worst. How should we know when to doubt a translation? When the interpretation, meaning or explanation is insulting or demeaning to someone, especially if it be towards women. The majority of statements which appear to negate the importance or power of women, often are due to being read literally, with the simple translation leaving out the esoteric and deep underpinnings. Chavah embodies both the essence of life itself and the creative ability to grant that life to others. A great example of this is with the first woman in history. In English, we refer to her as Eve. Yet, that is not her Hebrew name and her English translation doesn’t carry with it any of the importance or significance of her real name, Chavah. Furthermore, there are even some links between the word “Eve” and “evil,” blaming her for the evil brought into the world due to the sin of eating from the Tree of the Knowledge of Good and Evil. Yet Chavah, according to the Torah, is clearly a positive figure, and the sin, while a complicated discussion in itself, is most often explained as a descent for the sake of an ascent. So what does Chavah mean? According to the Jewish mystical tradition, there are three main concepts connected to the Hebrew name Chavah. The first comes from the explanation given in the Torah itself: because she is em kol chai - the mother of all life (Genesis 3:20). The medieval commentator Rashi explains this phrase. The name Chavah is a derivative of the Hebrew word chayah, meaning “living one.” Chavah embodies both the essence of life itself and the creative ability to grant that life to others. The idea of “mother of all life” expresses not only the ability to physically give birth, but also to create, nourish, and enhance all facets of life. This is the ability of a mother - to take something from the state of potential, develop it, and bring it to actualization through her creative abilities. Chavah is not only the mother of life but also represents the experience of life. The question though still remains as to why Chavah wasn’t called Chayah? What is the difference between these two names? When looking at them in their Hebrew spelling, the difference in each name is one letter. The name Chavah has a vav which is numerically equal to six, and Chaya has the letter yud which is numerically equal to 10. The difference between these two number is four, the letter dalet. Rabbi Ginsburgh teaches that if we add the letter dalet to the name Chavah, we get the word chedvah, meaning “joy.” This teaches us that we transform Chavah into Chayah, into “life,” when she can birth with joy. It is vital to mention that this is not merely the idea of physical birth. The concept of being a mother is being creative, birthing new realities into this world. And as we bring these lives into the world, we must do it with joy, even though the process may be a painful one. The second understanding of the name Chavah focuses on its connection to the word chavayah, which means experience. Chavah is not only the mother of life but also represents the experience of life. The marriage of the first couple, Adam and Chavah, is truly a marriage of the human experience, the human condition. With this explanation, we can better understand the relationship between her and Adam, her husband. The name Adam is not merely a first name whose literal meaning is man, but also refers to mankind, to humanity in general. Therefore, the marriage of the first couple, Adam and Chavah, is that of the representation of human experience, that of the human condition! The third meaning stems from a verse in the book of Psalms (19:3) "Night following night expresses knowledge." The Hebrew word for expression is yechaveh, which is also related to the word chavah. In this vein, there is a verse in the book of Job (36:2)"Wait for me a little while, and I will show you." The Hebrew phrase for I will show you is veachavecha, again from the same root. This third meaning of Chavah can be understood as expression, revelation, or manifestation. 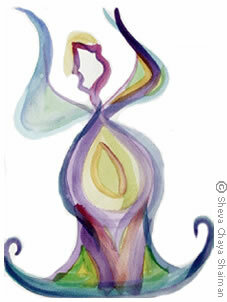 About the artist: Sheva Chaya created the art for TheJewishWoman.org homepage. An art graduate from Princeton University, Sheva Chaya works in watercolor and glass, vibrantly exploring Jewish and women's themes. Her work can be seen in her studio in Tsfat, Israel and on her website. I love yr article n it's meaningful. As a Christian, G-D shows us direction which u n I can't see ahead but G-D can. I trust dat G-D has made u special of who U today. great article, as usual however I did not understand the connecton between chavayah and the marital relationship(explanation number two) nor how it figures in the wrap-up at the end. Please Respond I enjoyed your article very much, it was refreshing and stimulating. I am interested in your repsonse to Gershon Mcgreevy. Please forward your answer to his question to me. Is it not a greater joy that we feel when we realize that we have been far from home and are now able to appreciate what we are returning to? Do we not appreciate our parents more once we leave home and earn our own way, build our own family and home?